Sorry for the delay on getting you this post. I was working from the MAC Store at 5th Avenue and Central Park at 1 a.m. I wasn't up to the cut and paste. So here were some quick notes for the International Fancy Food Show. New York and the Fancy Food Show has been amazing. Honeys, teas and gluten free are the buzz words. Saw an amazing cracker line made with sweet potato. I had a quick chat with Ina Garten. 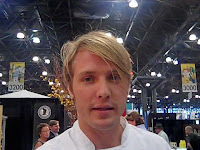 Jeff McIinnis from Top Chef 5 was a doll and let me shoot some video. He is too gorgeous for words. Rose Levy Beranbaum of the Cake Bible fame chatted on video as well. Tonight we saw Jackie Mason at dinner.